Errai (Gamma Cephei) is the among the visually brightest stars to host a planet, and also has a low mass companion with a relatively small orbit. The circle shows the location of the class K2 giant star Errai (Gamma Cephei) in the constellation Cepheus. The planet, with a mass of at least 1.85 times that of Jupiter, is one of the few known to lie within a double-star system, and orbits the main star Gamma Cephei A with a period of 2.47 years at an average distance of 2.05 Astronomical Units (307 million kilometers, 191 million miles), or 2.05 times the distance between the Earth and the Sun. The orbit is only slightly eccentric. Suggestions for the planet's existence go back to 1992. The planet is in a double star system whose separation is comparable to the size of our own planetary system, and shows that planets can be formed and survive in relatively close binary systems. An estimate of the inclination of the system from the stellar rotation gives a true planetary mass between 3 and 16 Jupiters. 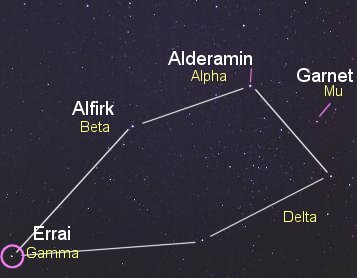 Errai (Gamma Cephei) is one of a few planet-hosting stars that have proper names, some others being Edasich (Iota Draconis), Pollux, Algieba (Gamma Leonis), and Rigil Kentaurus (Alpha Centauri). "Errai" comes from Arabic and means "the Shepherd." At a distance of 46 light years, Gamma Cephei is a bright, third magnitude (3.22) class K1 giant with a surface temperature of 4920 Kelvin (860 degrees cooler than our Sun), a luminosity 10.6 solar, and a radius 4.5 solar. Direct measure of angular diameter gives a radius 4.9 times that of the Sun, confirming the validity of the parameters. With a mass estimated to be 1.6 times that of the Sun, the star's core is quietly fusing helium into carbon and oxygen Spectral variations suggest a rotation period of 781 days. Gamma Cephei is accompanied by a low mass companion (a red dwarf with a mass around 0.3 or 0.4 solar masses) that orbits with a period between 57 and 66 years at a distance of about 19 AU. A substantial eccentricity takes the secondary star from 12 to 26 AU from the primary. From the planet, the secondary star would shine with the light of a couple dozen full Moons. Written by Jim Kaler, updated 5/20/13. Return to The Planet Project or go to STARS.